Propionic acid bacteria can synthesize all amino acids by assimilating nitrogen from ammonium salts (Kucheras and Gebhardt, 1972). These bacteria also contain peptidases capable of supplying the cell with all essential amino acids. 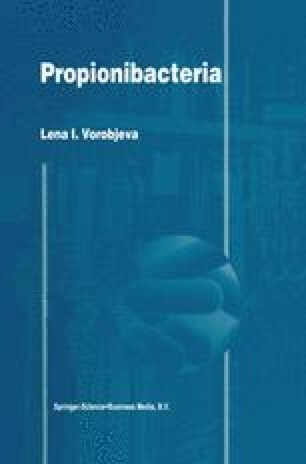 As have been recently shown (Langsrud et al., 1995), the proteolytic system of propioni-bacteria consists of at least two weak proteinases, one cell wall-associated and another intracellular or membrane-bound. In 7 strains of propioni-bacteria found in Swiss cheese at the stage of ripening the proteolytic activity was maximal at 15, 30, 37 and 45°C (Perez-Chaia et al., 1988). At 21°C no strain displayed any proteolytic activity. Evidently, such a complex pattern of temperature dependence is due to the presence of several enzyme systems. The pH-optima of the proteases of these strains were in the range of pH 5.7–6.1, except for P. acidipropionici, whose activity was weakly dependent on the pH between 5.1–6.4.